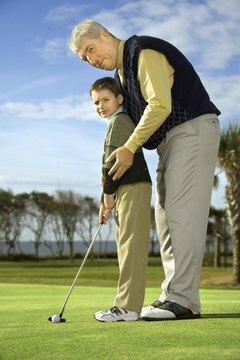 Most local golf courses offer affordable golf lessons for beginners. While you can get years of enjoyment from playing golf, for most people it takes a while to learn how to play the game. Start out by consulting a golf professional to get advice about buying the right equipment and to learn the proper swing. Once you have mastered the basics, don’t be afraid to get out there and play. Register for a beginner’s clinic at a local golf course or driving range. It is much less expensive to start swinging the club in a group than to take private lessons at first. As an added bonus, you will meet people who are just starting out and may become your golfing buddies later on. Keep a notebook to record tips from the pro, and practice by hitting a bucket of balls between sessions. If you are having a problem executing everything you learned, focus on a couple of pointers at a time. Ask the pro for suggestions about which golf clubs to buy. As a beginner, look for a more lofted wood with a flexible shaft and a large face. The 3- and 4-iron, which can be difficult to hit for beginners, may be best saved for later sessions. Instead, get some hybrid clubs in addition to higher-numbered irons and wedges to help you hit the ball in the air. Begin the swing with a pre-shot routine to focus your mind and check your grip, posture, balance and ball position. This routine should be consistent with every golf shot. Watch videos to see the correct golf swing before practicing. Notice how on a right-handed swing the shoulders turn on the takeaway until the left arm is parallel to the ground. The wrists will be at 90 degrees at the top of the swing, and the weight will shift to the back foot. On impact, the arms are extended as the weight shifts to the front foot. Remember to follow through the ball completely until your chest is facing the target and your right heel is lifted from the ground. Consider private lessons once you have mastered the basics, especially if you feel you have stopped improving or if you are developing bad habits. Private lessons are a way to learn specialty shots like hitting out of the rough and the bunker and hitting a fade or a draw off the tee.